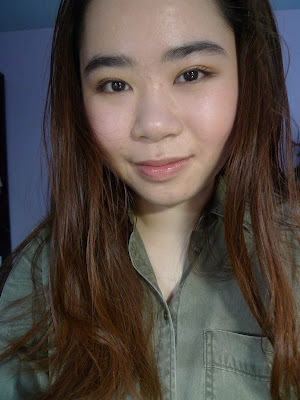 Keeping the skin fresh and natural with a illumiating base and a light foundation. Use whatever fits for your skin-type. Don't go over-matte or super-glowing, just keep it in between on a everyday base. 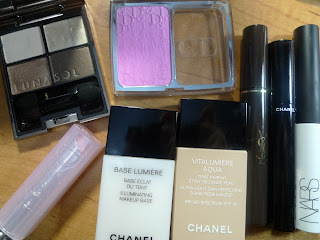 (but glam it up if you want, whatever fits you best) Chanel base lumiere and Chanel Vitalumiere Aqua foundation is a perfect fit for this fresh and light base. Using a eye primer like the Nars Pro Prime first before hand will definitely help your eyeshadow last the whole day. With keeping it simple, I use the lower-left eyeshadow from the Lunasol palette as a all-over-the-lid shade. Simple natural brows YSL brow gel and a bit of mascara Chanel le volume de chanel to help keep things simple. Dior rosy glow blush is a glowing pink blush that is perfect to give you the glowing wake up look. Dior addicted lip glow just help finish everything for a moisturizing smooth lips.